Once again, Comichron and ICv2 have released their annual joint report on the fiscal state of the comics industry. The good news is that 2015 was one of the best years in awhile; comics sales reached a record modern-era high of $1.03 billion, up 10% over 2014. 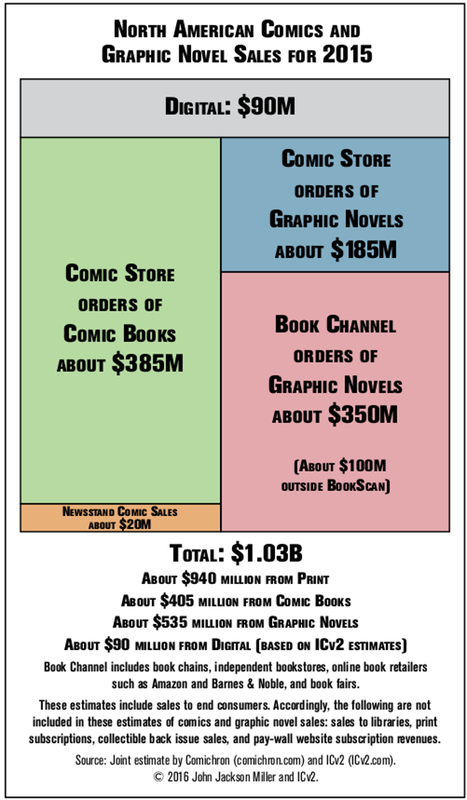 Below is an infographic made by ICv2/Comixology, listing the various comics categories’ sales figures. Information is based on estimated or actual data. Comics publishers and Diamond being who they are, some figures are only available via estimates data, such as digital comics sales. Not included in the figures below are digital subscription services (like Marvel Unlimited), library sales figures, and mail subscriptions. While comic shop sales have improved, the biggest growth category is in bookstore graphic novel/trade paperback sales. Those would include books bought at chains like Barnes and Noble, or ordered from online book sellers like Amazon. Also of interest is that trade paperbacks/graphic novels now occupy 52% of the comic market, making up a majority of all comics sales. 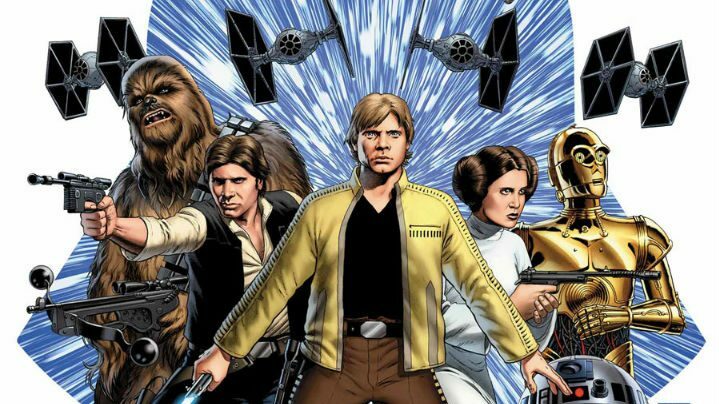 Comics publishers still put a large emphasis on single issue comic sales, and longtime fans might have nostalgia for the format. However, the fact remains a majority of comics readers don’t read their comics via $4-an-issue monthly installments. The sales of tablets and smartphones leveling off. The rise of alternate, cheap digital comics venues like Humble Bundle. The Nook tablet and platform’s decline in relevance continued through 2015. I suspect the rise of services like Marvel Unlimited are also affecting digital comics. (It went unmentioned by Comichron and ICv2.) Just as Spotify’s rise has led to a decline in the sales of digital music files (i.e., MP3s), something similar might be happening with digital comics sales. ICv2 and Comichron do note digital’s still a big part of the modern comics landscape. Digital sales continue to draw in a new, more diverse readership. I buy my comics digitally these days, and don’t expect Comixology to die off anytime soon. It helps Comixology’s owned by Amazon. Finally, there’s been no change in newsstand comics sales, though they’ve been irrelevant for some time now. Digital’s pretty much the “new” newsstand. Next Post:Brexit leading to more expensive US comics in the UK?